Princess Azmei died for her country three years ago–or so everyone but a trusted few believed. Having survived assassination attempts, the desert, dragons, and a treacherous plot designed to destroy her entire family, Azmei has finally managed to save her kingdom. Now she has to save the world. Azmei travels to Amethir, whose prince she promised three years ago to marry. With her is Hawk, the man who loves her, and Yar, the Voice of Dragons. They carry a terrifying message for the king of Amethir: the gods are waking and the world is about to shake. Prince Vistaren of Amethir has also received a frightening warning, this one from a powerful stormwitch–weather magic is failing. Patterns of storms are beginning to build outside their prescribed season. While the Stormwitch Academy officially denies any problems, there are hints of trouble yet to come. Azmei and Vistaren know they must act. But the king refuses to listen to them and the land is beginning to tear itself apart. 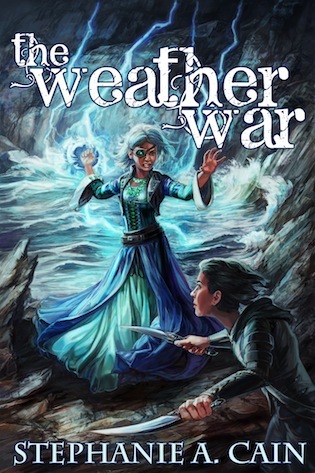 Facing pirate attacks, seadragon swarms, and a strange woman who uses magic in a way no stormwitch should, Vistaren and Azmei know they must find a way to set things right. But what price is too high to save the world? 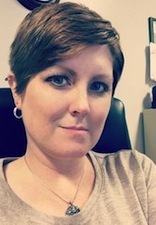 Stephanie A. Cain grew up in Indiana, where much of her urban fantasy is set, but unfortunately has been unable to visit Amethir or Tamnen, where her epic fantasy novels are set. She graduated from Purdue University with a Bachelor of Arts in History and Creative Writing, with a Medieval Studies minor. She has two-thirds of a Master of Library Science, but ran out of money and enthusiasm for grad school at about the same time. Despite this, her years of work in libraries were not wasted--besides having a lot of librarian friends (everyone should have at least one) she also spent a great deal of time hanging out in the stacks at 398.2, which gave rise to many of her urban fantasy stories. She currently works at the General Lew Wallace Study & Museum, where she spends her time doing historical research, giving tours of a Victorian man-cave, and serving as a one-woman IT department. Stephanie's favorite authors are J.R.R. Tolkien, C.S. Lewis, Elizabeth Moon, Tamora Pierce, Garth Nix, and Robin McKinley. 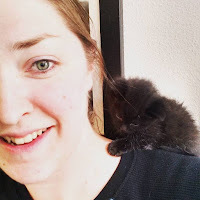 A proud crazy cat lady, Stephanie is happily owned by Eowyn, Strider, and Eustace Clarence Scrubb. In her free time, she enjoys hiking (except for the spiders), bird-watching, visiting wineries, and collecting anything with owls on it. She likes to unwind by playing World of Warcraft and Skyrim. She enjoys organizing things, is overly fond of notebooks, and visits office supply stores for fun. She owns way more movie scores and fountain pens than she can actually afford.